It's not often that you see people pose with a potted veggy, much less communicate with it. 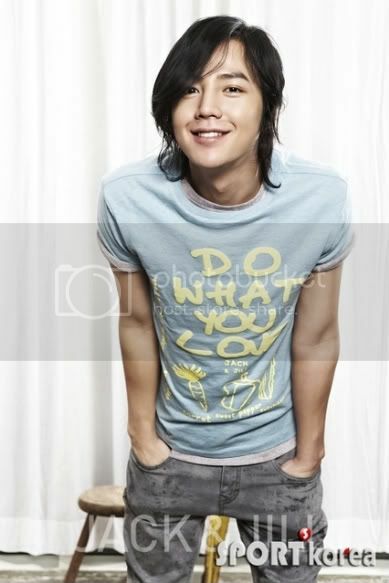 However, that's what it looks like Jang keun Suk is doing in the large photo. To me it looks like he's perched on that shabby chair, gazing down at that potted vegetable...and talking and smiling to it ! As for the small pix- es.....why.... he's holding that potted veggy like it's something precious [which it is] . I made the picasa collage above from photos of Jang Keun Suk taken at an eco-campaign photo-shoot for NYLON, jointly organized by casual wear brand, J & J (JACK & JILL) . J & J together with NYLON promotes the idea of having your own urban farm. The urban farm concept is where people grow their own vegetables on their own property and promote a sustainable healthy lifestyle, while saving the environment at the same time. Urban Farm as an environmental movement is currently gaining popularity across Europe and America, it is hoped the movement will spread all over the world. Seeds for plants like Chinese cabbage, lettuce, beet, and others is made available for collection by customers at J & J stores. Ohh, the eel again!! You really like him??? He he...actually, Jang Keun Suk is not the eel....myoce is the eel..
JKS's fans are called eels...cos he loves them [eels] so much. Yes...I really really really like him, having fallen in love with him since I watched "You're Beautiful"